DELORO – The provincial government has known for over a decade that arsenic has poisoned the soil around the homes of residents of this tiny eastern Ontario village. And for years people were breathing air laced with arsenic dust, government records reveal. But the environment ministry never let them in on these potentially deadly little secrets. Last night, they found out. Residents have known for years about the pollution problems around the 280-hectare mine along the eastern edge of town, but they did not know the problem was so close to home. About 30 village residents attending the meeting were outraged. “If we knew this information in the first place, we never would have bought a house here,” shouted angry resident Gord Dancey. About 175 people live in the village. The residents were also anxious to learn results of a ministry health test last fall that involved soil and dust sampling, and voluntary urine samples from residents. Jim Ritter, the ministry’s Deloro project engineer, conceded the ministry was aware of contamination within the village when the tests were started last fall. Researchers at a Probe affiliate – the Environmental Bureau of Investigation – uncovered a ministry document revealing that tests conducted on private property in Deloro outside the mine site more than 10 years ago showed arsenic contamination in the soil 30 times higher than levels now considered acceptable. The tests were done in 1986 and 1987 by the ministry’s phytotoxicology section, but the results were never made public, according to the document. They never even shared the results with others in the ministry, although members of its regional office’s operations division provided them with a guided tour to take soil samples, the document says. Adams believes the province, which took control of the Deloro mine site in 1979, should provide residents with financial assistance to relocate. The information made public by Energy Probe was contained in a “briefing note” prepared by the ministry for a meeting in Belleville last Feb. 18 with health ministry officials and the area’s medical officer of health to discuss what amounted to the accidental discovery of high levels of arsenic within the town. Deloro is about 45 kilometres north of Belleville beyond Highway 7, between the towns of Marmora and Madoc. An outside consultant had conducted some soil sampling tests around the mine and in parts of the town in 1997 as part of the ministry’s ongoing cleanup efforts. The consultant recommended additional studies after finding arsenic levels ranging between 190 and 1,200 parts per million (ppm). Ministry guidelines recommend a soil cleanup when arsenic reach 25 ppm. Members of the phytotoxicology section reviewed the consultant’s proposal on Feb. 2, 1998. Four days later the section’s manager informed the ministry’s Deloro cleanup project engineer that the work proposed by the consultant had already been done in 1986 and 1987. Those earlier soil tests from 18 sampling sites around the village revealed an average arsenic level of 723 ppm – nearly 30 times higher than the level recommended for cleanup with a maximum finding of 5,500 ppm. 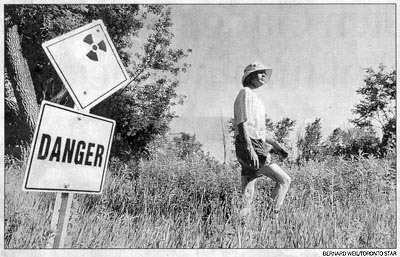 The briefing note’s author, Dave McLaughlin of the ministry’s standards development branch, wrote the arsenic in the village likely came from the smoke stacks of the refinery that closed in 1961 and more recently as contaminated dust blown by the wind from piles of mine wastes known as tailings. The tailings piles are now covered by rock to prevent the dust from blowing into the town just west of the mine property boundary. Arsenic, a by-product of the mining industry, is a known cancer-causing agent. It can be ingested through food grown in contaminated soil or absorbed through the skin. Small amounts absorbed over a period of time can result in chronic arsenic poisoning, producing nausea, headaches, colouration and scaling of the skin anorexia and white lines across the fingernails. Ingestion of large amounts can lead to vomiting, renal failure and death.